Within a small mining colony on the dark and distant planet of Lethe, events are occurring the results of which could dramatically affect things on a universal scale. For within the dingy corridors of the artificial biosphere, the lone survivor of a devastating crash has expertly wormed his way into the lives of the colony’s personnel. A scientist known as Davros. Separated from one another across space and time, the Doctor and Mel find themselves in very different predicaments: Mel has been employed on Lethe, while the Doctor has been imprisoned aboard an alien spacecraft. Both situations are inexorably linked, however, and at the apex of the two sits Davros and the terrifying possibility of a new threat even more powerful than the Daleks! Rescuing Mel and stopping Davros should be the Doctor’s primary goals, but could it be that this time, Mel does not wish to be rescued? And might Davros actually be working on something for the benefit of the civilised galaxies? Colin Baker is the Doctor in The Juggernauts. Throughout the history of Big Finish’s production of Doctor Who, there have been plenty of stories that looked great or intriguing on paper. The Axis of Insanity centered the idea of a space station containing and isolating fractured timelines, only to do very little with the actual concept, instead giving us an annoyingly over-the-top villain. …and the Pirates looked to be something unique, advertised as a full-fledged musical. Only one episode contains signing. Instead, the story gave listeners a look at coping with enormous personal tragedy. Master was 3/4th’s a solid discussion between friend and foe about the very nature of evil and tabula rasa, only to fall completely flat on its face in the fourth act. Minuet in Hell was the grand and glorious meeting of the Eighth Doctor and the Brigadier…in what could damn well be the Plan 9 From Outer Space of Big Finish audios. The Juggernauts is another story that attracts a listener’s attention. The Sixth Doctor! Davros! Mel, tricked by Davros to work with him! Daleks! Mechanoids! A grand battle between two robotic menaces! What sounds like the various pieces of an amazing story fail to come together properly, with three solid performances surrounded by a thin veil of supporting characters and wrapped up inside a plot that treads familiar ground. There’s no time to argue, as the Sixth Doctor convinces Mel to leave a burning alien ship via escape pod. Before he could escape in his TARDIS, however, the Doctor is captured by none other than his hated foes, the Daleks! With the opportunity to exterminate him at their plunger tips, the Daleks instead request the Doctor’s assistance. It seems their creator, Davros, has once again escaped certain death. With the assistance of a far-flung human colony, Davros is creating a new race of mechanical beings whose sole function are to be the ultimate Dalek killers…and more importantly to the Doctor, working alongside Davors to create these so-called Juggernauts is none other than one Melanie Bush! The story may call them “Juggernauts,” but the spheroid robots in question are actually known to fans of Doctor Who as the Mechanoids. The Mechanoids appeared only once on television, way back during the time of the First Doctor in the 1965 serial The Chase. Their purpose was to prepare a colony site on a distant jungle planet for a group of human settlers who never arrived. During the events of The Chase, the Mechanoids clashed with the Daleks, gaining the upper hand several times before the Daleks destroyed their city. The Mechanoids have appeared several times in the expanded universe, involved in a losing war against the Daleks before their final extermination in the short story Birth of a Legend. Beginning the performances of the main cast, this is only Bonnie Langford’s second time alongside Colin Baker in an audio after 2001’s panto piece The One Doctor. The rough, bubbly edges of Mel’s optimistic exterior are toned down in this story, but as opposed to the material given to Langford in The Fires of Vulcan that allowed her to show the dramatic range she was denied on television, the listener is treated to a Melanie Bush who’s presence in The Juggernauts is a mix of “tell, don’t show” and mischaracterization. Crash landing on the small colony of Lethe, Mel is separated from the Doctor for a period of three months. During that time, she integrates herself into the lives of the colonials, spending her work hours in the laboratory of Dr. Vaso in the creation and programming of what she believes will be the greatest service robots the universe has ever seen. The three month time jump means that the “getting to know you” portion of the relationships between Mel, Vaso, and the colonials isn’t portrayed in the story. While this lets the listener get to the crux of the story sooner, it also means that the listener has a hard time buying just how close Mel has become to Vaso and the other colonials, specifically her fellow scientists Geoff and Sonali. The friendship between them, as recorded, is based upon Geoff awkwardly (and in a bit of a creepy “Nice Guy” manner) hitting on Mel, while Sonali and Mel engage in what another reviewer brilliantly called “chuckle-talk.” It’s light banter, mixed in with quiet laughter and meant to convey a sense of “these characters all know and are close, ain’t that great?” It comes off as just a bit forced, and what’s meant to be a burgeoning possible romantic relationship between Geoff and Mel instead comes off as a bit creepy. It’s not a slight on Langford, who’s portrays Mel’s optimism and cheerfulness to the utmost, but it shows one of the big concerns of the script in not showing any sort of relationship development. The relationship between Mel and Vaso is a bit better, but another concern comes with the heaps of praise Vaso delivers to Mel for her work with the Juggernauts. The listener doesn’t get to see any of said work, coming in at the very end of the Juggernaut’s production, but it would have been nice to have some “last minute adjustments” for Mel to make to justify Vaso’s praise. It would have made the sudden-but-inevitable betrayal of Vaso/Davros towards Mel mean a little bit more as she realizes (and the listener understands just how) she’s been duped by this madman. The only time we really see Mel use her much-hyped computer skills is when she reveals she had installed a “back door” command within the Juggernauts that allows her to command them. It’s the one bright point, however, as a few scenes later, she order the same Juggernauts to kill Davros! Langford tries to get over the anger Mel feels, but the fact is such an action goes against every single bone in Melanie Bush’s body, to order the cold blooded murder of a sentient being, even one as twisted as Davros. The script barely led up to the moment, perhaps meaning for it to be a “WHAM” moment where everything changes for Mel in the long-term. Instead, without any coaxing from the Doctor, Mel is back to normal a few scenes later. Langford does her best, but the script doesn’t do her effort any justice. Mel is the central character for the first half of The Juggernauts, until the Doctor bursts on the scene in the story’s second part. Not one for tact and subtlety, Colin Baker forgoes any attempt at being sneaky or stealthy, immediately finding Mel, letting her know that Dr Vaso is really the man scientist Davros, and then storming off to confront Davros in his own lab. Solid Snake under a cardboard box, the Doctor isn’t. We get some very nice references to the regret the Doctor deals with for not killing the Daleks in Genesis of the Daleks and passing up the chance to serve as Davros’ executioner in Resurrection of the Daleks, mixing the Doctor’s honor with his pragmatism. Brash, flippant, bombastic, considering working with Davros to wipe out the Daleks on one hand while knowing such a thing could only end badly with the other, Baker does what he always does with Big Finish and turns in an absolutely great performance. Specifically, his scenes opposite Terry Malloy’s Davros are of the highest quality and hold the listener riveted throughout. In many ways, The Juggernauts serves as a follow-up to the classic audio Davros. 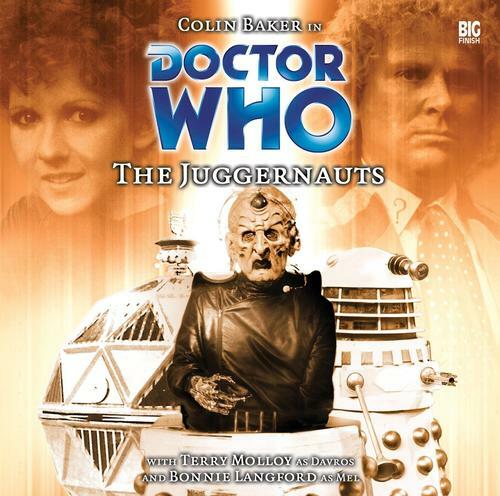 The Juggernauts is a standalone story, but those who are familiar with the middle-story from the Villains Trilogy will find more to enjoy with the back-and-forth between the Sixth Doctor and Davros. Terry Malloy slides right back into the role of Davros; kind and charming when under the guise of Dr. Vaso, angry and ruthless once the curtain is pulled back, and willing to do anything and everything to save his own skin and his designs, whether the enemy be a galactic corporation or the Daleks. There’s no doubt from the moment of the reveal at the end of the first episode that Malloy IS Davros. For just a moment, Malloy makes the character’s supposed motivations believable enough that the listener thinks that maybe, just maybe, Davros is finally on the side of the angels. Of course, it falls through as the Juggernauts are just meant to replace the Daleks as the supreme beings of the galaxy, but it’s a massive credit to Malloy that he pulls off that moment of doubt. However, much like Mel’s moment of extreme anger, there’s a moment near the end of the story where Davros’ chair is about to reach critical and explode. Instead of using the opportunity to take the Doctor, his most hated foe with him, he tells the Doctor to run and save his life. It just felt so incredibly out of place for Davros, who runs on superiority and hatred, to have any sort of pity towards the Doctor, and this goes double if one has listened to Davros. The supporting cast feels like they were added simply to pad out the story’s run time. The two scientists, Sonali and Geoff, are played by Bindya Solanki and Klaus White, respectively. Geoff is the male “love interest” who hits on Mel, only for it to come off creepy and desperate, especially once we find out he was rejected by Sonali. Aside from talking up Mel and giving her a bit of a backstory for her three months on Lethe, the pair’s sole purpose in this story seems to be giving it a second-half subplot where they try to help the colony’s population escape before the Daleks can exterminate them. It leads to a “chase” as Geoff tries to lead them away and then double back to the escape ship before making the ultimate sacrifice, but it doesn’t add anything to the story OR to the Doctor/Davros/Mel dynamic other than to pad out the serial’s run time. Even the “music box” scene at the very end comes off as a bit more resigned than poignant. Peter Forbes as Kryson and Paul Grunet as Bauer add little to the proceedings as the corporate backers of Davros’ experiment other than the stereotypical “evil corporate” types who get in over their head and would stab each other in the back for a profit. Their presence also adds a drug addiction subplot to Kryson that goes absolutely nowhere other than Davros’ mentioning it as a piece of blackmail to hold over Kryson. And that ties into what is the story’s biggest flaw. In the end, The Juggernauts is a story that’s been told before. Davros is back, and he’s trying to destroy his creations! But this time, he’s using humans to make up the core of the Juggernauts! And he lies to everyone until his moment of triumph where he tries to kill everyone! It’s just all been done before, and in better stories. There’s nothing original…well, check that. The sound work by Steve Foxon is top notch. The Mechanoids sound different enough from the Daleks, with a very melodic, 8-bit voice even as they clash with their foes (and a scene where someone gets crushed to death by a Juggernaut will either be laughable or cringing to a listener; I ended up cringing). The Daleks (Nicholas Briggs, of course) sound great, but Briggs and Foxon deserve a credit for the voicing of the “damaged” Daleks from the starship crash that brought Davros to Lethe. Crying “EX-EX-EX-TERM-IN-ATE” as they chase their foes, it’s a unique twist and one I’d like to see on television sometime. If The Juggernauts had been a televised serial, with the clash between Mechanoids and Daleks played on the screen and an hour of run time to cut out some of the secondary characters, it might have had a shot at being one of the classics. I think that’s why I’m scoring this one a little higher than I normally would, as I waffled between two numbers before settling on the higher one. Baker’s great. Langford’s great, given how the script asks Mel to act out of character. Malloy’s great, even as Davros acts against type to give the Doctor a chance to save his skin. The Daleks, both Imperial and “damaged,” sound great. The Mechanoids are a neat idea and come off well. But…this is just a story that I was really excited to listen to, and I enjoyed it as I was listening to it. As time passed, however, the flaws became readily apparent; poor secondary characters, a subplot that goes nowhere, a waste of the Mechanoids in the long-term, and Mel acting in such a way that it reminded me of the Doctor’s pride from Medicinal Purposes. If I came across this story randomly during re-listens, I wouldn’t skip over it, but it would definitely be a time-filler that I wish had been done better. Oh, well. They can’t all be Davros. Synopsis – Two great performances, a solid performance, and the clash between Daleks and Mechanoids can’t overcome The Juggernauts and its wasted potential, with a script that treads familiar ground and focuses too much time on unneeded secondary characters. 3/5. Peter Davison is the Doctor in…The Game. This entry was posted in Big Finish Review and tagged 3/5, Big Finish, Bonnie Langford, Colin Baker, Daleks, Davros, Doctor Who, Doctor Who Audio, Doctor Who Review, Mel, Sixth Doctor, TARDIS, Terry Molloy. Bookmark the permalink.